Reflections on SG: Lui Tuck Yew: Sacrifice Or Sacrificed? When the Electoral Boundaries Review Committee recommended that Moulmein-Kallang GRC be dissolved and absorbed by neighbouring GRCs, some people wondered whether it had anything to do with the fact that Minister for Transport Lui Tuck Yew is one of Moulmein-Kallang GRC's Members of Parliament. The transport portfolio is one of the hottest political portfolios, as the public remains dissatisfied with the state of the public transport. But dissolving Moulmein-Kallang GRC doesn't solve anything because Mr Lui has to stand in another GRC or SMC, and dissatisfaction with public transport will likely follow Mr Lui wherever he goes. Besides, the Electoral Boundaries Review Committee is supposed to be politically neutral. Then on Tuesday, Mr Lui announced that he would be stepping down from political office. It seems he has been thinking about this for several months and the upcoming general election is an appropriate occasion to do it. It is unclear whether Mr Lui sacrificed himself or he was told to sacrifice himself, to save the PAP. It is rather odd for several cabinet ministers — Deputy Prime Minister Teo Chee Hean, ministers K Shanmugam, Tan Chuan-jin, Chan Chun Sing and Yaacob Ibrahim — express their regret at Mr Lui's impending departure. Had Mr Lui stood in any GRC or SMC in the coming general elction, he would likely have been a lightning rod for voters. But is it fair for the public to blame Mr Lui — or for that matter, Mr Raymond Lim, his predecessor at the Ministry of Transport — for the grossly inadequate capacity of Singapore's public transport especially at peak hours? Prime Minister Lee Hsien Loong said that the Cabinet had collective responsibility. 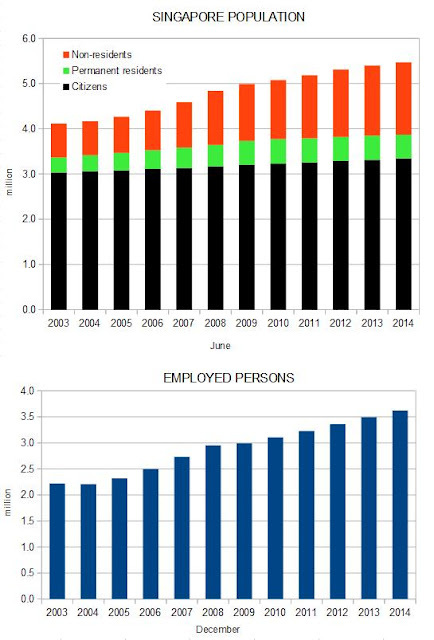 Apart from Mr Lee and his deputy prime minister(s), it seems that the political office holders who were responsible for driving economic growth with immigrant labour were mainly the ministers for trade and industry and manpower during the relevant period. Mr Lim Hng Khiang has been the Minister for Trade and Industry since 2004. Dr Ng Eng Hen was Minister for Manpower from 2004 to 2008. He was succeeded by Mr Gan Kim Yong who held the portfolio until 2011. Mr Yeo Cheow Tong was Minister for Transport from 2001 to 2006. He was succeeded by Mr Raymond Lim who held the portfolio until 2011, when he was succeeded by Mr Lui. Did either Mr Yeo or Mr Lim realise that the public transport system could not cope with the huge and sudden influx of immigrants? Did either of them inform the Cabinet? What was the Cabinet's response? Mr Lui inherited a public transport headache that resulted from the decisions made by others in Cabinets past. Unfortunately, it is a situation that cannot be resolved within four years. But one for which he now has to pay the price. 1. The charts are based on data provided in Land Transport Authority's annual publication Singapore Land Transport Statistics In Brief. Data for the bus fleet size in 2014 were not available. This article was last updated on 14 Aug 2015 at 3:15 pm. 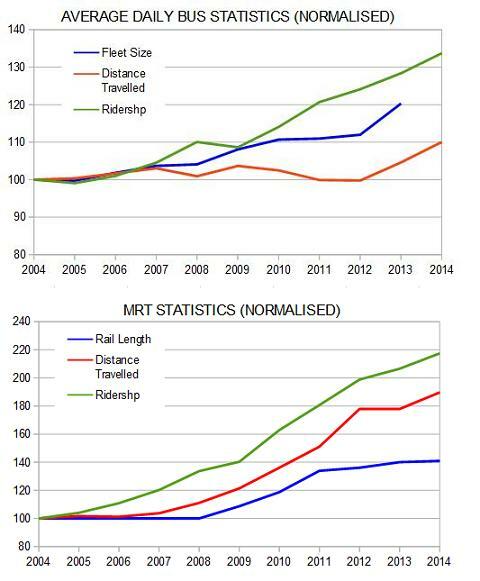 The data series Distance Travelled was added to the chart MRT Statistics.